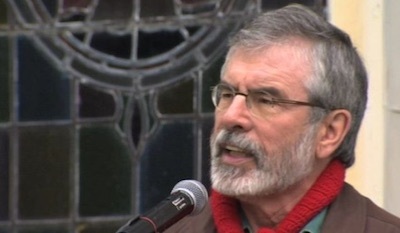 Sinn Fein leader Gerry Adams made a call for a “referendum on Irish unity” on Easter Sunday as he spoke at a 1916 commemoration in Roslea, County Fermanagh. He did not specify if the referendum should be a national one or the ‘border poll’ within the Six Counties, as Sinn Fein has previously argued for. A proposal for a Six-County Border Poll was agreed as part of the 1998 Good Friday peace deal. Under the agreement, only the British Direct Ruler can determine if and when a poll may be called, the wording of the poll and who qualifies to vote. While a national (32 county) act of self-determination has been a long-frustrate demand of the Irish people through the centuries, a border poll, held only within the Six Counties, would be sectarian and partitionist, its critics say. Mr Adams told the commemoration that a “peaceful revolution” was needed to “take control of the Proclamation”. “Sinn Fein is committed to securing, in the time ahead, a referendum on Irish unity so that each and every one of us, working together, can build a new, dynamic country,” he said. He called for the current build-up to the 1916 centenary next year to act as a catalyst to a national conversation on the issue of partition. Adams claimed that the proposed “referendum on unity” would not be seen as threatening to any section of our community and that Sinn Fein would appeal directly to working class unionists and loyalists to examine the economic and social price now being paid for the union. “Austerity policies imposed by an Eton-educated English elite is no more in the interests of people of the Shankill Road than it is for residents of the Bogside,” he said. “The people of this island, whether urban or rural, from whatever background or tradition, share a common history and our futures are bound together. “The message of the Proclamation, the symbolism of our national flag and the challenge for republicans today is to unite Orange and Green in equality and mutual respect,” he continued. “All political objectives can now be pursued peacefully and democratically and in mutual respect. Mr Adams argued that the current partition of the island of Ireland is impacting the economic status of both north and south saying, “many people now realize that it makes no sense to have two economies, two education systems, two health systems, two tax codes, two currencies on one small island. “Partition has retarded and distorted the political, social and economic life of this island.”, he said. Adams made the comments at one of a number of 1916 Easter Rising commemorations that took place throughout Ireland on Easter Sunday. In response, the Sean MacDiarmada 1916 Society in Fermanagh criticised Sinn Fein “double-speak” over what it said was a misleading attempt to portray a Border Poll in the same context as an All-Ireland referendum. “Sinn Fein having signed up to the Good Friday Agreement have accepted British rule in Ireland, as such have no credible strategy to achieve Irish Unity and are left with no option but grandstanding attempts to promote an internal Six-County Border Poll, which denies the democratic rights of the people of Ireland,” they said. “A Six-County Border Poll legitimises the very mechanisms invented by Britain to harness division and sectarianism by endorsing the Unionist Veto and accepting the artificial statelet that incubates and nurtures the sectarian dynamic in Irish politics. Republican Sinn Fein also denounced Sinn Fein’s call for a referendum on Irish unity, whether on a Six County or 32 County basis. “As long as Ireland is divided and one section of the Island is occupied by a foreign military force, there cannot be a truly democratic referendum,” a spokesperson for Republican Sinn Fein said.